The Password:JDM Carbon Fiber Airbag Trays have been described as a work of art! We showed this off and everyone only had nice things to say! But to us, it’s just another product that we should have made available a long time ago. Our Password:JDM Carbon Fiber Airbag Trays are a direct replacement! It’s perfect for those who choose to have their airbag removed for safety reasons on road courses or when drag racing. Crafted from aerospace grade 2×2 twill Carbon Fiber and 100% high solid epoxy resin, our bags trays are designed to fit the USDM vehicles without any modification to your stock dash. What this means is that you can retain your factory airbag and reinstall it later if you need to. The Password:JDM Carbon Fiber Airbag Trays are truly plug & play! Installation takes less than 20 minutes, and requires only the basic tools that every car enthusiast should have! A quality fit and finish is guaranteed. 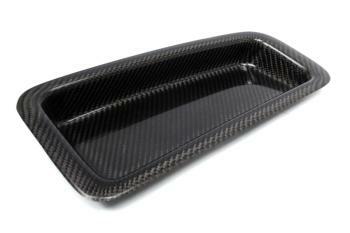 The Password:JDM Carbon Fiber Airbag Tray is a nice finishing touch to any vehicle that’s show/race worthy. These are high quality pieces crafted here in the States. Like all of Password:JDM’s products, these are produced one at a time. The exceptionally consistent quality you would expect from us is delivered each and every single time. Modifying, disconnecting, or removing airbag systems, components and/or hardware should only be done on vehicles used purely for race/show purpose only. In some countries, it is illegal to tamper or modify any portion of the supplemental restraint system (SRS). Please check with your local, state and/or federal laws pertaining to automotive SRS systems. Password does not assume any liability for damages resulting from the use of our Airbag trays. End users assumes all liabilities when using this product. Our Airbag trays are intended strictly for off-road racing use only!!! Mounting requires the use of some sort of bonding agent such as double sided tape along the edges or a silicon adhesive. Removal of the factory airbag (SRS) should be done by a trained and certified professional who knows how to disconnect the battery and SRS control unit prior to any airbag removal. All Password:JDM Dry Carbon/Kevlar products are hand crafted and as unique as a finger print, no two items will be exactly identical. Small imperfections such as wavy weaves, small bubbles and resin blemishes will be inevitable. Such minor imperfections are race industry standard and considered acceptable. Therefore it is NOT considered to be defective. All Password:JDM Dry Carbon/Kevlar products require professional installation. Minor adjustments might be necessary. This is part of the normal body work and installation process. Password:JDM has made all efforts to produce its aftermarket products to fit the original factory vehicles as closely as possible. However, some occasional prepping may be necessary for an ideal fit. The buyer needs to perform these steps to his/her satisfaction before installation. If the buyer wishes to paint the products, he or she must pre-fit the parts to the vehicle before painting to ensure proper fit. There will be absolutely no returns on painted products.